Anyone who has tried to purchase a high accuracy meter for LCR measurement at a reasonable cost will have discovered the problem. There are plenty of low cost hand-held LCR meters available, but the accuracy is poor and the facilities very limited. There are plenty of high performance LCR bridges available, but the costs are typically an order of magnitude greater than the simple hand-held units. The LCR400 bridges the gap. It provides the performance and facilities required for precision component measurement at a price not far above that of a hand-held unit. The LCR400 is a low-cost precision LCR bridge intended for use within component inspection, laboratories and production facilities. The basic measurement accuracy is 0.1% and the maximum measurement frequency is 10kHz. The LCR400 is housed in a rugged casing of sufficient weight to stay where it is put. It incorporates a high quality four terminal test fixture with adaptors for axial or radial components. The fixture is unobstructed for ease of use with bandoliers. The LCR400 sets a new price standard for a high performance LCR meter. Advanced design techniques utilising the latest component technologies have made this possible. Now a precision component measurement system is within the budget of every area of a company from the laboratory through to goods-inward inspection. The LCR400 provides comprehensive facilities for sorting components into ‘Bins’ according to value. The binning parameters can be defined from the keyboard of from a PC via the RS-232 interface. Up to eight pass bins and two fail bins can be defined. Bin limits can be sequential or overlapping from a single nominal or can be based around different nominals. The LCR400 incorporates non-volatile memory for up to nine complete instrument set-ups. An RS-232 interface allows control to be exercised from a PC enabling the remote storage of set-ups and remote logging of results. (R accuracies apply for Q<0.1. L accuracies apply for Q>10. C accuracies apply for D<0.1 and after Null). Binning Up to 8 Pass bins can be defined plus Fail on minor parameter and general Fail. Vnútorný upínač Sprung jaws for vertical lead insertion. Plug-in sliding pillars for horizontal lead insertion. Bias Voltage Menitelné 2V polarizované napätie. 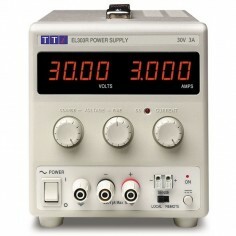 External bias up to 50V. Typ displeja Dual 5-digit 0.56” LEDs. Zobrazené funkcie R+Q, L+Q, C+D, C+R, PASS/FAIL, Bin No. Typ rozhrania RS-232 cez 9 pin D konektor, 9600 baud. Permamentná pamäť Do 9 komplétnych nastavení. Vstupné napätie 230V or 115V ±14%, 50/60Hz, internally adjustable, 25VA max. Installation Category ll. Teplotný rozsah +5°C to 40°C operating 20 - 80% RH, -40°C to 70°C storage. Bezpečnosť V súlade s EN61010-1. EMC V súlade s EN55081-1 a EN55082-1. Rozmery 360 x 240 x 95 mm, aj z nožičkami. LCR-SMD Surface Mount Tweezers (4 terminal). Plugs directly into the standard component fixture on the LCR400. LCR-BNC Plugs into the standard component fixture to convert it into a set of four BNC connectors. LCR-K-Clip High quality Kelvin Clip test lead set terminating in BNC plugs (requires LCR-BNC). LCR-PCLink Windows based software which logs results (values and binning) and can store/restore set-ups.